Powersports Business recently completed our Q3 2017 dealer survey in partnership with BMO Capital Markets analyst Gerrick Johnson. The 96 dealers surveyed represented 37 states and four Canadian provinces. Of the dealers surveyed, Yamaha (43 dealers) and Polaris (38) had the greatest representation, followed by Honda (33), Kawasaki (29), Suzuki (22) and Can-Am (19). The survey showed positive trends both year-over-year and compared to Q2, ending a downturn of weaker results that had been part of the Q2 survey. The side-by-side and ATV categories registered the strongest improvement, while PWC/boats maintained their solid performance. Motorcycle retail sales in Q3 remained weak. Business conditions rebounded in Q3, with 76 percent of dealers calling business conditions as either average, good or very strong. Only 63 percent of the dealers said the same in Q2. Similarly, the response was also better than the results from Q3 2016, when 73 percent of dealers said business conditions were either average, good or very strong. Looking at unit sales year-over-year in Q3, 60 percent of dealers said sales grew, with 20 percent citing double-digit growth. Remember, our surveys include side-by-side dealers. And while overall unit sales grew, sales relative to the dealer principals’ business plans improved only slightly on a sequential and year-over-year basis, with 17 percent reporting business being above plan and 49 percent saying it was below plan. Overall, 71 percent of dealers are expecting some form of growth over the next 12 months, versus 29 percent who are expecting some form of contraction. Those metrics compare to 74 percent and 26 percent, respectively, in Q3 2016. Looking at their off-road vehicle business, Can-Am was the outperformer, with 79 percent of dealers reporting sales increases. Polaris followed, with 76 percent of dealers reporting sales increases. The Polaris data is notable in that only 43 percent of Polaris ORV dealers reported a sales increase in Q3 2016. Overall new unit sales improved versus Q2 2017, and the Q3 2017 reading was the best we’ve observed since we began our partnership with BMO Capital Markets in Q2 2016. In Q3 2017, 39 percent of dealers said new unit sales were either good or very strong, with 31 percent saying poor or very weak. This is an improvement from Q2 2017, when 26 percent of dealers said they were either good or very strong, with 40 percent saying poor or very weak. It’s also a similar improvement from Q3, when only 27 percent of dealers responded positively, and 41 percent called new unit sales as either poor or weak. When asked more specifically about actual unit sales performance on a year-over-year basis, PWC was once again the top-performing segment, with 81 percent of PWC dealers reporting growth. A total of 70 percent of respondents said their side-by-side business was up, with 31 percent up by double digits. This is a significant increase from the 54 percent of respondents who claimed their side-by-side business was up, with 26 percent up by double digits, in our Q3 2016 survey. Dealers who complete the survey receive the composite data results as a PDF. The Q3 2017 PDF of the survey that dealers receive includes more than 20 pages of Q3 and historical data. Dave McMahon is editor in chief of Powersports Business. Contact him at 763/383-4411 or dmcmahon@powersportsbusiness.com. 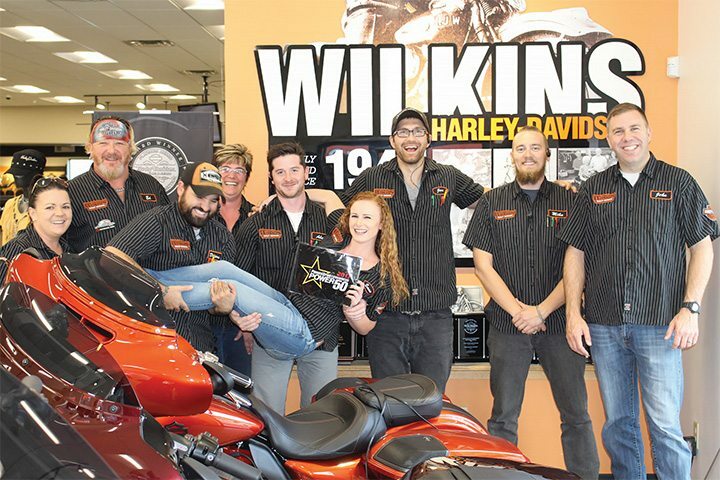 Wilkins Harley-Davidson staff members show off their 2017 Powersports Business Power 50 window cling at the dealership in Barre, Vermont. Did you get your award? 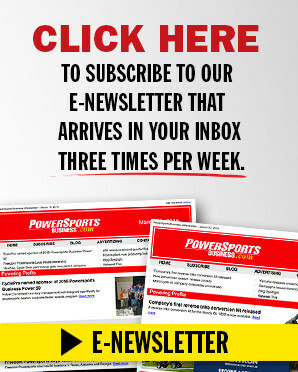 Send your photos to dmcmahon@powersportsbusiness.com and share your accomplishment.